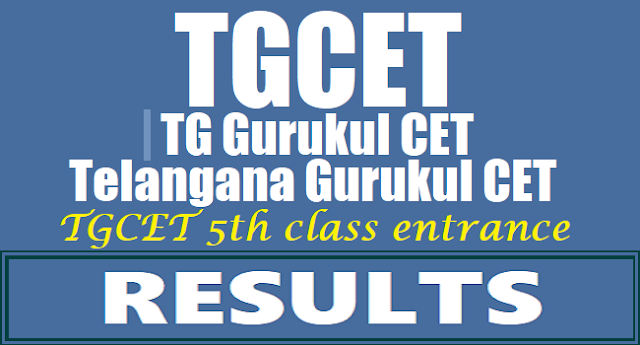 TGCET 5th Class Entrance test results 2019/ Telangana Gurukul CET 2019 Results/ TG Gurukul CET 2019 Results/ TGCET Results 2019, TGCET Merit List to be announced on May 18 and Certificates verification, 5th class admissions counselling to be started in May 2019. Telangana Gurukul CET 2019 notification had been issued by the Telangana Government and Online applications were receiving from 18-02-2019 to 15-03-2019 through TGCET Web portal. TG Gurukul CET Entrance exam held on April 9, 2019. The candidates who were appeared for this 5th class common entrance exam, they are waiting their results. The results to be announced on May 18. So, candidates may check their results from the tgcet.cgg.gov.in website after announcement of TGCET Results. TGCET 2019/ TS Gurukulams 5th Class Common Entrance Test 2019 results to be announced in May. TGCET Candidates may check their results from the given below link. Step 3. Telangana Gurukul CET 2019 page will be displayed.